Living in California comes with many perks. One of the main ones being the weather. While most people are shoveling snow out of their driveways, I can only dream and imagine what that would feel like. Los Angeles residents, including me, tend to be spoiled with the beautiful palm trees and sunshine year round. Although I do miss a snow filled winter and having to experience all four seasons. As soon as it starts sprinkling, I get excited and bring all of my outerwear out. Most of the time, I am wearing a coat and a scarf when it's only 65 degrees! ( I know, I know, that's not considered cold weather!) It was gloomy out this morning, which is why I brought out all of the muted shades. I love color and playing around with color is a big part of my personality but recently, I have been gravitating more towards neutrals and classic black. I brought out my favorite flared jeans and threw on a grey coat with a high neck blouse. I added my blanket scarf on as an accessory and was ready for my usual cappuccino for the morning. How Do You Do Low Key Style? How do you do low key style? With the New Year in full force, athleisure and low maintenance styling are definitely on my go-to list. Dressing for a quick and easy errand filled day could be a lot harder than we think. The key is too spend less time worrying about your outfit and more time focusing on feeling confident. Clothes that look and feel good are important, which welcomes the athleisure trend. Athleisure combines the comfortable lounge wear with stylish workout gear. If you’re anything like me, you do not own too many hoodies or leggings but I have collaborated with Target to bring you some styling tips that we can both incorporate into our ensembles this year. If you’re constantly on the run like me, it can be tough to find something to wear for all day. I have several “athleisure” style pieces that I wear around the apartment and on runs to the flower mart. When Target asked me try out the trend, I wasn’t sure what to expect. That being said, I totally loved my athleisure look. I paired my printed leggings with a chic black pullover for breakfast and errands and swapped into a cozy cardigan and sneakers for a night out. I will definitely be investing in more athleisure pieces. If you’re looking to see more ways to do low key style, check out this "How Do You Do" from Target styling casual and stylish pieces together for inspiration! 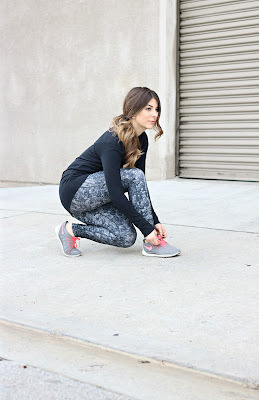 I would love to see how you style your athleisure pieces! Tag me and use the hashtag #HowDoYouDo and let's inspire each other to try dressing comfortably chic in 2016!